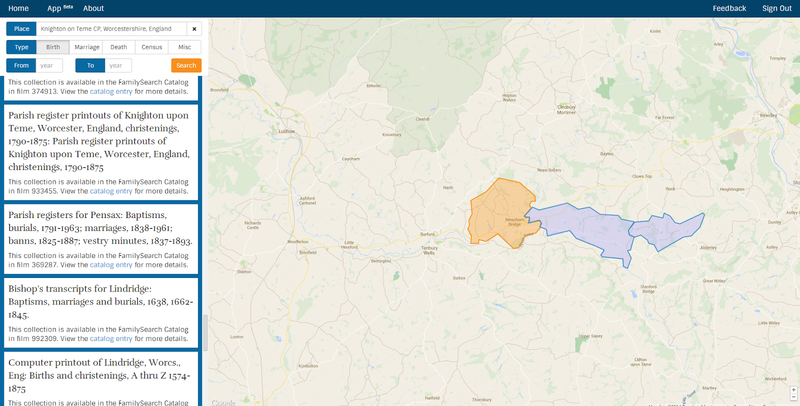 Boundary searching is now live on Find-A-Record. As shown in the Friday video from last week, you can search for collections within an entire county, state, or country all at once. Don't forget to install the Chrome Extension for an enhanced search experience from within FamilySearch and Ancestry trees. Right now we have collections from Ancestry.com, digital collections from FamilySearch.org, and FamilySearch catalog entries for the UK. Find-A-Record is still in beta. If you have any ideas for new features or find a bug, please let us know. We are aware that a lot of collections in England are incorrectly mapped to the country level instead of the county level. We have plans to fix that tomorrow. * This post is a day late because we were heads down preparing for RootsTech yesterday and completely forgot about it.